Designed as an environmentally new product to dissolve dog waste within minutes, Doggie Doo Dissolver is a new patented enzyme hitting the pet product marketplace. According to a release issued by the company, dogs in the United States deposit 30,000 tons of feces daily. Damage from plastic bags to landfills is escalating, so the Doggie Doo Dissolver folks hope this product will address the problem. An 8-ounce bottle of product will last up to a month, depending on the size of dog and frequency of stool. The product is touted as helping to lower bacteria levels at beaches by stopping storm water drain runoff from coming into contact with pet waste. The mastermind behind the product is James DePalma, a graduate of Notre Dame’s Mendoza School of Business in South Bend, Indiana. The “brains” behind the product is Dr. Chip Appel, who earned a B.S. in biochemistry an M.S. in soil science, and a Ph. D in soil chemistry from Cal Poly. He oversees and advises the earth and soil sciences department college-based fee committee. With results of a study in tow, Doggie Doo Dissolver reports that 14 percent of Americans tested positive for roundworms, one of the most common parasites found in dog waste. According to the Doggie Doo Dissolver company, the patented enzyme disperses the cells of the feces until there is nothing left. It is completely green and will not hurt any lawn or pet. 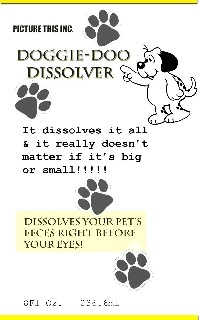 More information about the product can be found at http://www.poopdog.co/ and on Facebook at https://www.facebook.com/doggiedoodissolver.